Article in a previous week’s copy of The Economist (online at http://www.economist.com/news/international/21570679-cops-convicts-and-craftsmen-are-keeping-carbon-paper-alivejust-fade-black) mentioned that the last manufacturer of manual typewriters — a firm called Godrej & Boyce based in India — stopped production in 2009. In relation to Nirvana, I’ve commented before on the amazing gulf between the world in which we’re living and that which Kurt Cobain departed in 1994. A phrase used in recent years is ‘the digital native’, the idea of a group within society who have lived their entire lives surrounded by electronic forms of interaction creating a new nature, as normal to them as the organic or mechanical ones onto which this new world has been grafted. There’s little if any technology in Kurt Cobain’s songs but, essentially, that’s because before 1994 society wasn’t as saturated in consumer electronics as it is now. So, for example, if you wanted to phone Kurt Cobain, you called a landline. If he didn’t pick up, everyone was able to tell themselves he wasn’t in (he might not have been, there was no way to know). Nowadays, if you call someone’s mobile, they may forget to get back to you, something may happen that prevents them calling, but the technology is more firmly laced to the body of the individual — you’re calling a person not a home; an individual not an office, so it’s harder to hide from attention at twenty years’ distance. 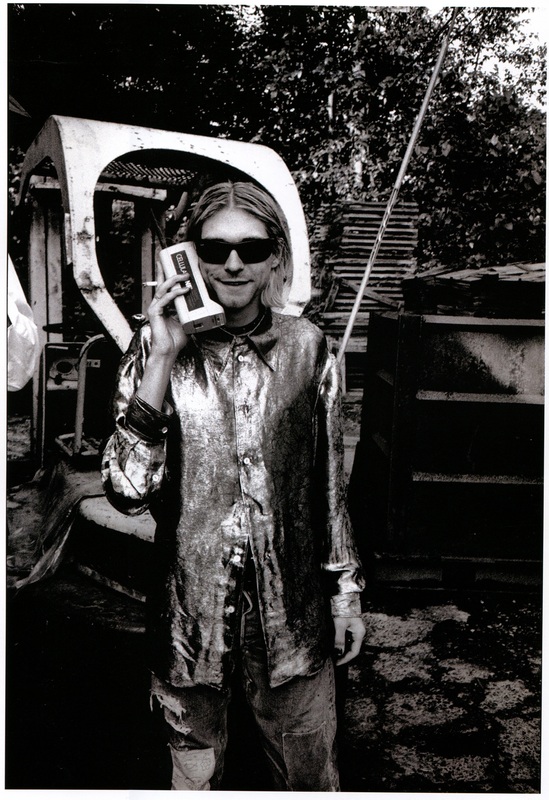 Kurt Cobain’s ability to vanish for periods of time post-fame was supported by the nature of the technology available. His writing, likewise, remained a purely manual process. He never, as far as can be told, sent email, used a computer, tapped away on a typewriter even. There’s no written communication from Mr. Cobain that purports to come from a mechanical or electronic source — there’s a mass of handwritten paper, however. His inspiration was only as fast as his scribbling, there wasn’t a back-up online someplace — hence why the 1992 flooded bathroom was so catastrophic — and if he didn’t have paper to hand then it’s unlikely he was working in great detail or depth — which is why the long home between tour-spells seem to have been so crucial in the writing process. Further reinforcing Kurt Cobain’s divorce from technology, there’s no indication in the various sources detailing the technical side of Nirvana’s recording sessions — see Endino.com, hunt down a copy of Charles Cross’ book on the Nevermind album, or read Gillian G. Gaar’s book on In Utero — that Kurt Cobain paid the slightest attention to the technology available in studio. He was clearly interested, for example, in seeing Steve Albini’s microphone set-up at Pachyderm Studios, not an unreasonable reaction given its apparent complexity, but not in learning the in depth details of the recording process. His role as a co-producer for Melvins’ Houdini album seems to have been name-only given the statements on LiveNirvana.com about the sessions. There’s no record of him involving himself in mixing, maybe choosing to record Something in the Way unplugged, or to plug Territorial Pissings direct were the biggest technology decisions he made in studio. He was essentially happy to ask for a “top 40 drum sound” or to comment on the tone and texture of the sound being produced, but he doesn’t seem to have wanted, during the short years of his life, to have wanted to learn how to do it for himself. Like most people, when Kurt Cobain needed or wanted to use technology he was totally willing and able to do so. The best example was his desire to use video technology to capture Nirvana at quite an early stage in their career. Krist Novoselic’s camcorder footage of the 1989 U.K. tour is readily available; Nirvana’s video made for the Sub Pop version of In Bloom is common knowledge; that he took the band into a video studio in March 1990 to try and kick-start preparation for a band video release. Even earlier than that Nirvana had tried, on January 24, 1988 straight after their first studio session, to record supporting videos for a few songs (including the later maligned If You Must). Kurt Cobain had a functional approach to video; his central issue was to express, the question was therefore how or who could do it — within that mix he was more than capable of getting out the video tech or waving cameras around. His closest relationships with technology though were with the products of bygone decades; the television, the guitar, the microphone, the radio. Consumer electronics stretched as far as record players and boomboxes — maybe today Kurt Cobain would be a prime candidate to be one of the guys with big headphones and a sullen expression shutting the world out and keeping eyes low. What exists instead is a musical repertoire in which the lyrics barely feature technology — no driving anthems, no escalators, trains, TV shows but no TV, an organic, fleshy, feely set of songs. Of course, without the wattage being shoved through the speakers where would we be? If you check the Journals, you’ll find two or three examples of Kurt’s words run off on an old printer, including his own press releases for the band, though I don’t know if he typed them himself. One of the printouts is annotated with his writing, though. Regarding his video use, one of the With the Lights Out menus has video footage of one of Kurt’s sculptures, or installations. For some reason my brain thinks this was shot by Slim Moon, or Dylan Carlson, but I don’t know why. He also mentions in a letter to Dale Crover maybe, making Super 8 films, so the switch to video would be no great hike, and I seem to also recall that once the advance came through the band got themselves Pixelvision cameras too. And just by the by, while I have never owned a mobile phone myself, this guy looks pretty happy, with apologies if the html don’t work! He pointed out to me that there’s a supposed AOL forum post by Kurt Cobain on March 29, 1994 as recorded in Dave Thompson’s book Never Fade Away. Only problem is, however, that I’ve never seen any other evidence that Kurt Cobain was one for faffing about sharing is thoughts online – so I’ve got no clue how to rate this source. Intriguing huh?